Allan is still not over his divorce from Nancy (Susan Anspach). Flabbergasted, he had asked her why. She didn't hold back ..."I can't stand the marriage, I don't find you any fun, I feel you suffocate me, I don't feel any rapport with you and I don't dig you physically ... oh, for God's sake Allan, don't take it personal". No wonder the poor fellow has an inferiority complex. Then ... As she left and over his protestations, she continued to vent. "I wanna go skiing, I wanna go dancing, I wanna go to the beach, I wanna ride to Europe on a motorcycle; all we ever do is see movies". ... and Now, this block, so steep that it has steps in place of sidewalks, is Kearny Street looking down from Vallejo to Broadway in North Beach (map). 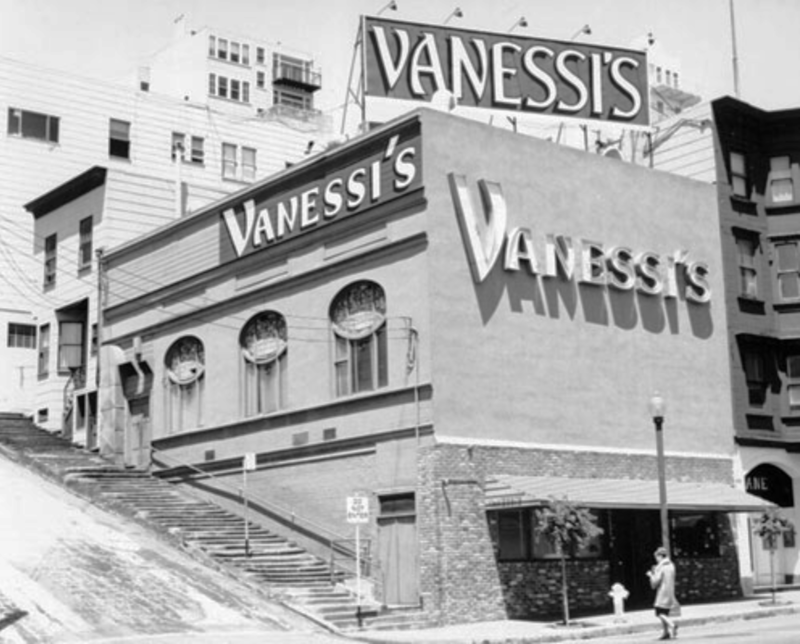 The building on the left with the arched windows at the bottom of the hill housed the iconic Vanessi's Italian restaurant for 50 years before it moved to Nob Hill in 1986, eventually closing down in 1997. On a trivia note, this same location, and Vannessi's, was seen 25 years earlier in the 1947 Humphrey Bogart movie Dark Passage. ... a vintage photo ... here's a 1964 photo of the restaurant in its prime. Odds are that Woody Allen would have dined there during the shoot (he was familiar with North Beach, having previously done stand-up comedy performances at the nearby Purple Onion and Hungry i clubs). Note the sidewalk steps on Kearny. Then ... Her parting shot to him before she hopped into her VW Beetle and drove out of his life... "My lawyer will call your lawyer". "I don't have a lawyer," said he, "Have him call my doctor". 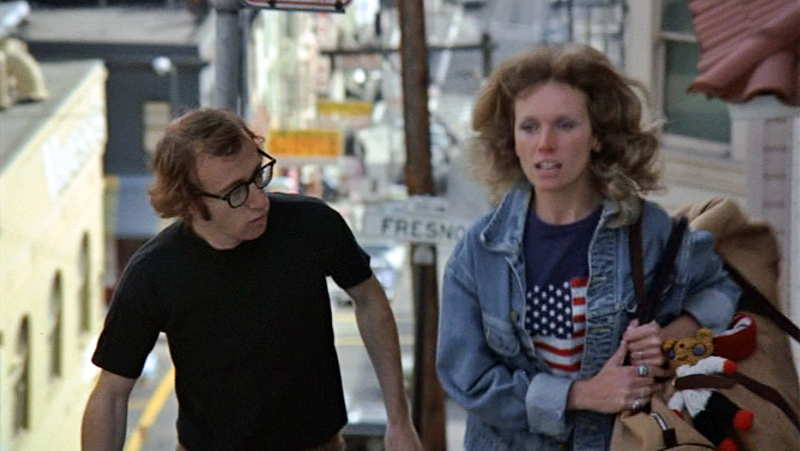 His hilarious deadpan gags, quintessential Woody Allen, set the tone throughout the movie. ... and Now, here's the same junction today, at Vallejo and Kearny.